“10000 times stronger killer of CANCER than Chemo“. It can save many lives, fill up hopes and build confidence in the patients. This tree is low and is called “Graviola” in Brazil, “Guanabana” in Spanish and has the uninspiring name “Soursop” in English. The fruit is very large and the subacid sweet white pulp is eaten out of hand or, more commonly, used to make fruit drinks, sherbets and such. If there ever was a single example that makes it dramatically clear why the existence of Health Sciences Institute is so vital, it’s the incredible story behind the Graviola tree. • Attack cancer safely and effectively with an all-natural therapy that does not cause extreme nausea, weight loss and hair loss. • Protect your immune system and avoid deadly infections. • Feel stronger and healthier throughout the course of the treatment. The source of this information is just as stunning: It comes from one of America ‘s largest drug manufacturers, the fruit of over 20 laboratory tests conducted since the 1970’s! What those tests revealed was nothing short of mind numbing. • Effectively target and kill malignant cells in 12 types of cancer, including colon, breast, prostate, lung and pancreatic cancer. • The tree compounds proved to be up to 10,000 times stronger in slowing the growth of cancer cells than Adriamycin, a commonly used chemotherapeutic drug! 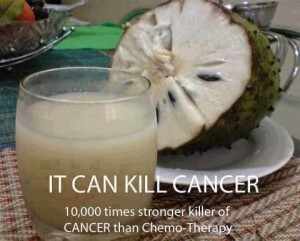 • What’s more, unlike chemotherapy, the compound extracted from the Graviola tree selectively hunts down and kills only cancer cells. It does not harm healthy cells! When researchers at the Health Sciences Institute were alerted to the news of Graviola,! they be gan tracking the research done on the cancer-killing tree. Evidence of the astounding effectiveness of Graviola–and its shocking cover-up–came in fast and furious. The National Cancer Institute performed the first scientific research in 1976. The results showed that Graviola’s “leaves and stems were found effective in attacking and destroying malignant cells.” Inexplicably, the results were published in an internal report and never released to the public. Since 1976, Graviola has proven to be an immensely potent cancer killer in 20 independent laboratory tests, yet no double-blind clinical trials–the typical benchmark mainstream doctors and journals use to judge a treatment’s value–were ever initiated. A study published in the Journal of Natural Products, following a recent study conducted at Catholic University of South Korea stated that one chemical in Graviola was found to selectively kill colon cancer cells at “10,000 times the potency of (the commonly used chemotherapy drug) Adriamycin”. The most significant part of the Catholic University of South Korea report is that Graviola was shown to selectively target the cancer cells, leaving healthy cells untouched. Unlike chemotherapy, which indiscriminately targets all actively reproducing cells (such as stomach and hair cells), causing the often devastating side effects of nausea and hair loss in cancer patients. A study at Purdue University recently found that leaves from the Graviola tree killed cancer cells among six human cell lines and were especially effective against prostate, pancreatic and lung cancers Seven years of silence broken–it’s finally here!! !